I’m writing this post from thousands of feet in the air though I started it at the airport in Houston. I am on my way to Washington D.C. to moderate a panel on hyper local news sites. It sounds exciting but the cool thing about traveling, at least for me, is the down time. There is nothing else to do but write and read and eat and shop between flights. You are a captive of time and space, so you might as well make the best of it. You also come across ideas that during a normal day would whiz by you like so many other things do in our hectic lives. So, I was glad I was in my layover state of mind. I love Chris Powell and Extreme Makeover. I’m a huge fan. But I’m a bigger fan of this quote because its not just about weight loss, it’s about over all transformation. And that’s a good word. Transformation. It means to change from one thing to another. It denotes a process. It’s not a day to night type of thing. It shouldn’t be, it’s meant to last. So transforming yourself from the hobby writer to the for-real writers a process. It takes a mind change, a habit change, a priority change. And it takes courage because this process is scary as hell. What’s the difference between the hobby writer and the for-real writer? It’s the difference between a hobby cook and a chef, a karaoke singer and a siren, someone who just excerises and someone who works out– purpose and focus toward a goal. I think this quote hit me because I’m refocusing on myself, my blog, and my writing. After feeling lost in what my purpose as a writer was, a sudden flash came to me. I long since stopped thinking about writing as a hobby. I thought of it as a craft. Now I think of it as a calling, as part of my life, as something I need to do to make me feel good. It’s similar to exercise like that, where the goal is important — weight loss, energy, feeling better. There are goals for writing. For me, the goal is to be happy, to be heard, to live by my pen. To get there, I need to transform. 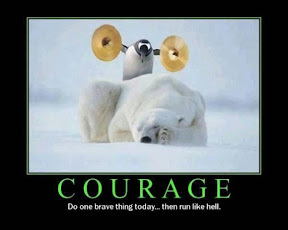 I need courage. So what is your writing goal? What will your transformation entail? Better yet, are you ready for it?